Saturday 24 February. Bairnsdale to Loch Sport. As you may realise there is a mobile signal here in Loch Sport but fairly patchy so I may not be able to update on time. I lost my luck with the weather today. The morning started dry until I loaded up the bike and left the motel when the first drops started and continued as fairly heavy rain for 3 hours. The afternoon and evening cleared up with temperatures reaching 25C. Loch Sport is situated on a long spit of land with a large long lake inland of it and the famed 90 mile beach on its coastal side. This is the Gippsland Lakes National Park area of SE Victoria. 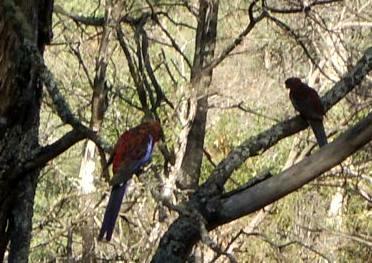 Bairnsdale is on the inland side of the lakes and as the crow (or parrot!) flies is about 12 miles from Loch Sport. However there are no ferries and the only way to get there is 83 miles by road. I took a back road with very light traffic and plodded on into the rain until it stopped about 11.00. 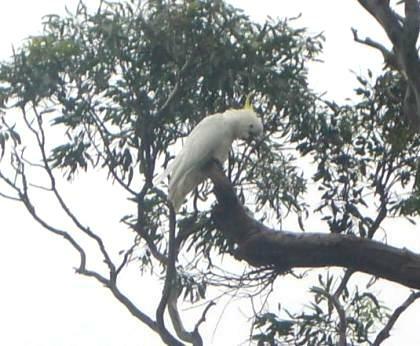 On the quiet tree lined road I was back in white Cockatoo territory with some of them making an almighty racket at being disturbed as I passed. I continued to the large town of Sale where I stopped for a picnic lunch beside a lake. Then south on the Gippsland Highway before turning off after a few miles onto the quiet Loch Sport road. For one section this was into the wind but I was overtaken by 2 cyclists on lightweight bikes and sped up to hold their slipstream for 8 miles until they turned off at Golden Beach. I arrived at Hanna's B&B in Loch Sport in good time. The room had everything one could possibly want for including welcoming goodies of fruit, chocolates, nuts and wine. I know some people who would have especially appreciated the latter! This will be my base for rest and recuperation before hitting the road in earnest again on Tuesday. After a meal at a nearby Hotel Bistro overlooking the lake I took pictures of a glorious sunset. 83 miles for the day and 475ft of climb. Saturday 24 February. Sunset at Loch Sport. Friday 23 February. Omeo to Bairnsdale. Weather today was sunny most of the time with a few thunderstorms in the mountains which I just missed. Temperatures rose as I cycled lower reaching 30C and quite humid. Although I was coming down from the mountains the day was far from easy with many ups and downs and a good distance. After a Motel breakfast in the room I was on the road by 8.00. After a lot of ups and downs near Omeo there was a good downhill with great early morning views across the mountain ranges. I came down to the small mountain town of Swifts Creek and spotted a bakers for 9.30s. An apple and raspberry slice just out of the oven filled the spot. The owner told me of the great bush fires in the area further down the road which had raged for 69 days and been put out in late January a week after we arrived. Further down I stopped for an elevenses break from my own supplies at a beautiful spot by a farm bridge. Rather ironically considering the difficulty Peter W had in getting lifts a farmer came along and offered me a lift to Bairnsdale as he was concerned it was going to be a very hot day. I reassured him I was used to the heat and the riding. The road followed the valley of the River Tambo eventually into a gorge where the serious fire damage was evident for about 10 miles. Dark thundery clouds had been building behind me with the occasional flash and rumble. I started worrying about another deluge but it passed to the east behind me with only a few spots. Later there was a long 5 mile climb as the road left the valley. 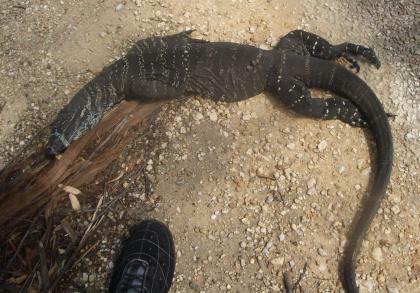 On the way down I spotted a really enormous lizard at the side of the road killed by a car. See the picture below with my foot below it for scale. I would not like to meet that when it was feeling better and I prodded it with long sticks to make sure it was really dead before getting near. Anybody know what it is? Add a comment at the end of this post. As I continued down the road another thunderstorm developed just to the west. I was cycling along under clear blue skies and sunshine while a short distance away there were dark clouds and flashes. I continued south and left the storm behind. I couldn't resist a stop at the small town of Bruthen which had a lovely caf? and garden called Le Caf? and an apple tart with ice cream went down well. After more ups and downs I got into Bairnsdale and the thunderstorms made it there in the evening. So far I have updated the Blog every evening (morning UK time) My next destination is a place called Loch Sport on the coast in the Lakes National Park where I stay 3 nights until Tuesday. There might not be a mobile signal there in which event I will next update on Tuesday. 74 miles for the day and 3103ft of climb and 5055ft of descending. I spent most of the day in the mountains and temperatures were a little cooler than of late only getting to 25C.The morning and early afternoon were bright and sunny but clouded over later with afternoon thunderstorms leading to the first drenching of the trip. Yesterday I did a 24 mile climb. Maybe I need more exercise, so today's big climb was 33 miles! After breakfast in the room I left soon after 7.00 and rode up the valley. The first 15 miles was very gradual with 600 ft climbed to Harrietsville. Then the more severe climbing started with one hairpin bend called the Meg being well known locally and recording 19% grade on my bike computer. Traffic on the climb was a little heavier than yesterday with a car every 10 minutes! The road wound its way up through the Eucalyptus Trees. I stopped for a snack from the supplies in my panniers and listened to the noises of the forest including Parrots and laughing Cuckaburrors. The climb went on and on and I eventually reached St Bernard's Pass at 4650ft where I stopped for a picnic lunch. The climb wasn't over yet though with more ups and downs to a high point above Hotham Heights Ski resort of 5830 ft and 33 miles climbed. There were outstanding views near the top across the Alpine ranges with Mt Buffalo and the Horn which I scaled yesterday visible in the far distance. Hotham Heights was a ghost Town with nothing open during the summer. The descent involved many frustrating ups and downs rather than going straight down a valley. Thunderstorms were building up over the mountains and the roads route took it seemingly just round the edge of the storms so I just got a few drops. 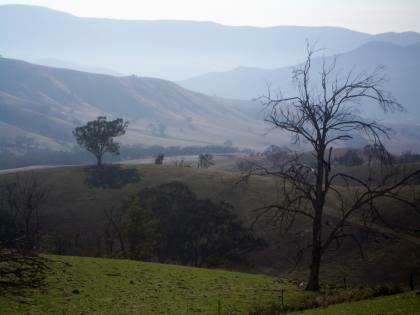 About 5 miles from Omeo as I crested a hill on dry roads I saw what looked like mist ahead. It was in fact a torrential downpour of rain. The sharp boundary line between soaking wet road and totally dry road was a few hundred yards ahead and stayed fixed for several minutes. Eventually it seemed to ease a little and I continued but the rain built to a torrential downpour with thunder rumbling around. There were a lot of coathangers in the motel which came in handy. The hardest ride for me since Yosemite in June last year. 67 miles and 6791 ft of climb. Thursday 22 February. 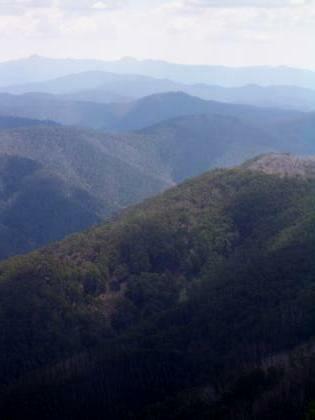 View from near Hotham Heights. 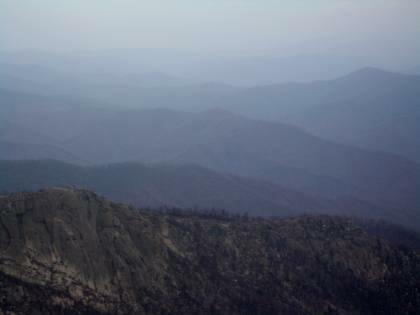 The Horn of Mt Buffalo is the peak on the top left. Wednesday 21 February. Bright Rest Day. Ride up Mt Buffalo . Weather today was warm and sunny in the morning but a little cooler in the afternoon with cloud moving in and a few spots of rain. Temperatures reached 29C. Today was a rest day in that I was staying 2 nights in Bright so did not have to ride anywhere. However I decided to ride up the local high road, a 24 mile dead end climb though Mt Buffalo National Park to the Horn viewpoint at 1723 meters or 5652ft, starting from 1000ft at Bright. This ride with over 20 miles of climbing would really have suited Peter T. Peter W would have done something else!! Why take on such a massive climb some may ask. The usual reasons, the challenge, because it's there, the views and as a unique way to totally experience the views fauna and flora of a very special area. I rode a few miles back the way I came yesterday and then turned off onto the Mt Buffalo road. I passed the entrance to the National Park which covers the Mountain and its foothills. Some of the cliffs rising 1000ft above reminded me of Yosemite. Early in the climb I was very pleased to capture some Parrots on film. These are often seen while riding but usually fly off at speed before I get in photographing range. Only a few miles further up and some rustling alerted me to a wombat at the side of the road. This was my first live wombat seen in the wild. Anybody in a car or bus might have briefly seen something which looked like a small Boulder or piece of wood. The Wombat was in the gully at the side of the road and although apparently uninjured and moving I was concerned it might have been injured by a car as Wombats are nocturnal and usually sleep in nests during the day. Many miles and hours later I asked at the Visitor Centre much higher up. 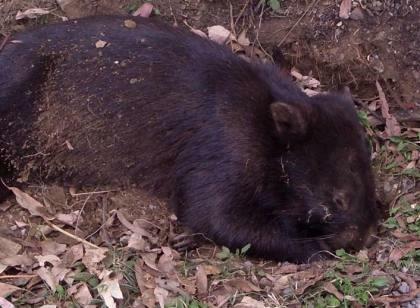 They told me that some wombats locally suffer from a blight and have to graze during the day to get enough food. 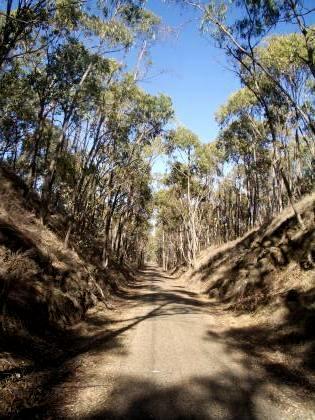 The climb involved many hairpin bends lined with gum trees. Traffic was shall we say light, about a car every 30 minutes. Vistas opened up during the climb ovelooking the Alpine ranges. Nearer the top there was a high plateau littered with great rocks. Some of the landscape looked like a fantasy world out of Lord of the Rings with skeletal white gum trees damaged by fire. The last 2 miles of the road was gravelled up to the Horn lookout. The motorists who were there and who had passed me earlier congratulated me on making it. There is a lookout with great views where I had a picnic lunch. Then there is a climb up a 1 mile track, which of course I did, to the very top of the mountain and a 360 degree lookout. The descent was a lot faster than the climb and is the real fun bit. I kept a lookout and spotted another Wombat on the way down. This again seemed uninjured and was awake but probably too sleepy to run away from me so I got more pics. 52 miles for the day and 5429ft of climb. Tuesday 20 February. Beechworth to Bright. Murray to the Mountains Rail Cycle Trail. Weather today was clear and sunny and still hotter than yesterday at 36C, 97F. When I left the hotel at 8.30 I knew straight away I should have left earlier when my bike computer registered 25C already. Today's ride was almost entirely on the Murray to the Mountains Rail Trail with a distance of 45 miles on the cycle trail. This was the longest and best cycle trail I have ridden. Surface was mainly tarmac with some sections where this was covered with fine gravel. There are 2 starts. 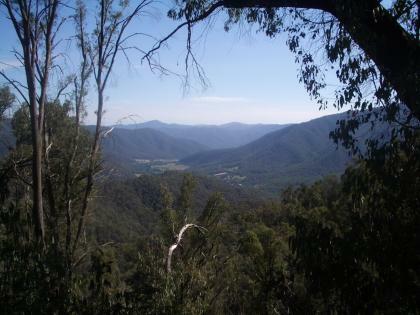 The first is further down the Overts River Valley and the second up the Spur line into the hills at Beechworth. This proved a good place to start as over the course of 11 miles the trail descended 1000ft. This part of the trail was cross country with no roads in sight. Unlike many UK trails the views were often open and not blocked by trees. After completing the descent to the main valley at Everton I stopped for a snack from supplies in my panniers. Then on up the Overts River Valley towards the mountains. The route is sometimes alongside the Great Alpine Road but most of the time at least a field away. I stopped in a Park in Myrtleford for a picnic lunch and then on to a caf? for a welcome ice cream in the rising heat. 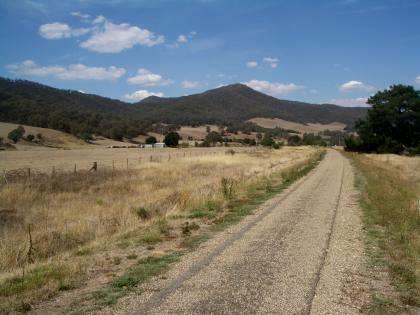 After a noticeable climb before Myrtleford the rest of the route was very gradually uphill but probably less than 1%. The route was well organised with several drinking water tanks on the route. These were useful both for extra water and to replace the warm to hot water in the bottles on the bike. I got through 6 litres during the day. Today is my birthday and it was very enjoyable to spend it riding such a unique bike route and in the heat of summer. One point of interest for the pedantic. When does my birthday start. Midnight Australian time or midnight UK time which is 11 am Australian time? 47 miles for the day and 974ft of climb. Monday 19 February. Train Melbourne to Wodonga. Bike Wodonga to Beechworth. Today I took the bike on a 200 mile train ride to Wodonga in the far NE of Victoria on the New South Wales Border. This is to be the start of a ride across the Victorian Alps, down to the coast and back to Melbourne. Weather started dull and cloudy in Melbourne but this cleared to blue skies as I travelled east. Temperatures during the day were a little lower than yesterday at 34C, 93F but still heat wave levels. Back in Melbourne cooler air had come through with temperatures only getting to 26C. The bike on the train was hassle free with a guard compartment at the rear of the train for bikes. Scenery was large expanses of bush farmland with the occasional isolated settlement. The train took a loop north and then east staying away from the high country to the south. 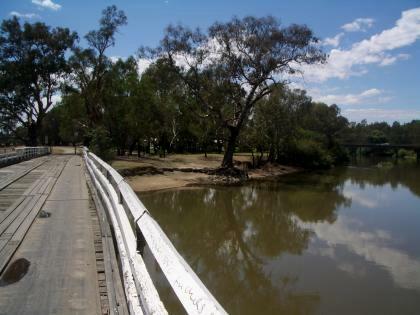 I had a picnic lunch in the park and then set off in search of the Murray River. This is at the north end of town and I couldn't pass up one final chance to see this great river we had seen so much of during the trip. It is also the border with New South Wales here. The only road across seemed to be the freeway but I had printed out a street map of town from the Internet at the Hotel last night. Using this I found a way on back roads and dirt roads to a rickety looking farm bridge. The Murray here being further up its course is much narrower. 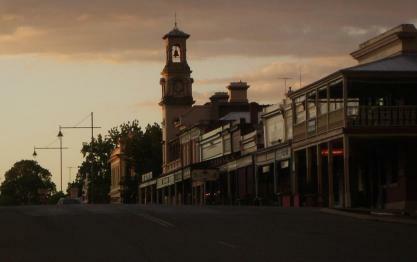 Beechworth is one of those classic historical Bush towns with many of the old buildings intact which goes to sleep at 8.00pm. 29 miles for the day and 2549ft of climb. Monday 19 February. River Murray at Wodonga. Sunday 18 February. Melbourne. Brighton Beach. Weather today was even hotter than yesterday with temperatures reaching 37C, 99F!! The wind was northerly bringing hot air from the continents interior. Another day off the bike, mustn't let this become a habit. Back in the saddle on Monday. I took a tram into town and then the Connex Suburban train down to Brighton Beach Station. I walked along the Esplanade to a viewpoint I had heard of. 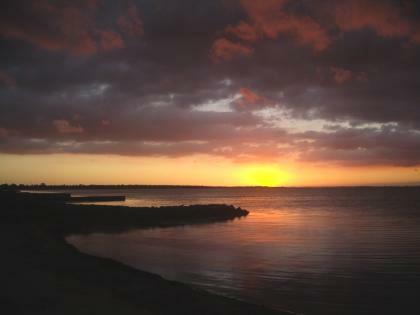 See the picture below with the curving Bay lined with Beach huts and the Melbourne Skyline in the distance. I sunbathed and swam on this beach. Earlier in the trip we had found the sea a little cool but now it was very warm. Later I walked on to Brighton Pier or rather the breakwater protecting Brighton Marina. I took a picture specially for Peter W who had wanted pictures of Melbourne from a distance and of Yachts but probably didn't expect both at once.. Tea or Pineapple Juice stop was at a Caf? at the Pier. Then back to base using train and then tram. I was indoors after a dinner locally before a violent thunderstorm with heavy rain signalled a break in the weather which is due to remain fine but cooler.